A character-driven danced funeral. A rite, a ritual, a crime scene. A sacred and profane theater of crime. A world unlike any other, inhabited by two women, existing neither here nor there. Natural matter, stones, water, fire. Sand with rubber. Light bulbs, mirrors, fans, plastic. The sound of these things, Omar Sosa playing live, and human voices. A complicated, powerful Xhosa woman who captivated the world with grace. My "Miriam" is the Virgin Mary, she is Joan of Arc, she is the Venus Hottentot, she is Nzinga. She is courage and beauty. I have to explain my work. Simon Dove moderates this artist talk, which takes place in the performance venue and is free for same-day ticket holders. 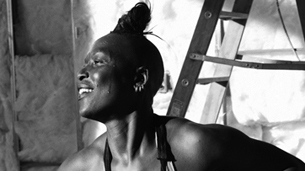 Zimbabwean choreographer Nora Chipaumire challenges stereotypes of Africa and the black performing body, art, and aesthetic.